Carper's statement to Cohen is included in her book, Only in Delaware, which is sold by the state of Delaware on its official website and covers her more than two decades covering the state's politics. Cohen notes in her book that the abuse allegation against Carper had resurfaced once, but that he managed to avoid facing the allegations throughout his political career. Carper "would not speak of the allegations, even when they were repackaged and resurfaced 14 years later while he was running for a second term as governor," Cohen wrote. "In an interview in 1998 for this writing, however, he dealt with them straightforwardly." Carper responded to the initial 1982 report by the New York Post that he hit his wife, which was based on a taped deposition of Carper taken as part of a custody fight between his wife and her first husband, by flatly denying it. "Let me say clearly and categorically that the implications in that story are without basis in fact," Carper told the News Journal a day after the Post story was published. He called the story "outrageous" and an attempt by his opponent at "political character assassination." Carper's campaign told the Post its story was "totally false." The custody battle between Diane Carper and her first husband was settled out of court, so a ruling was never made on the abuse allegations, and the deposition was never entered as an official court document, according to reports in the News Journal and Cohen's book. Carper and his wife agreed to give custody to the children's father. 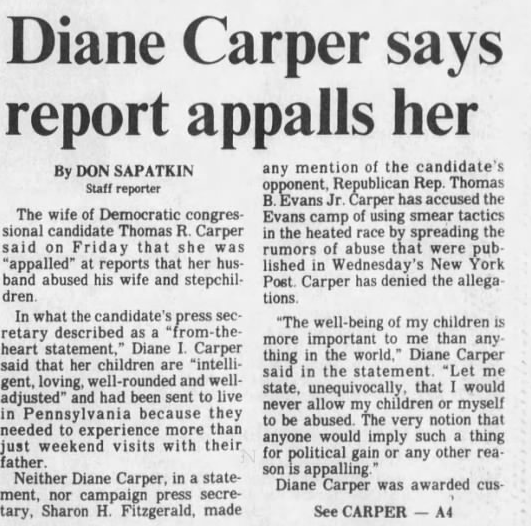 Diane Carper, who married the now-senator in 1978 and was a former Miss Delaware, joined in the effort to refute the allegations, which came a few weeks before the 1982 election. "Let me state, unequivocally, that I would never allow my children or myself to be abused," she told the News Journal in 1982. "The very notion that anyone would imply such a thing for political gain or any other reason is appalling." 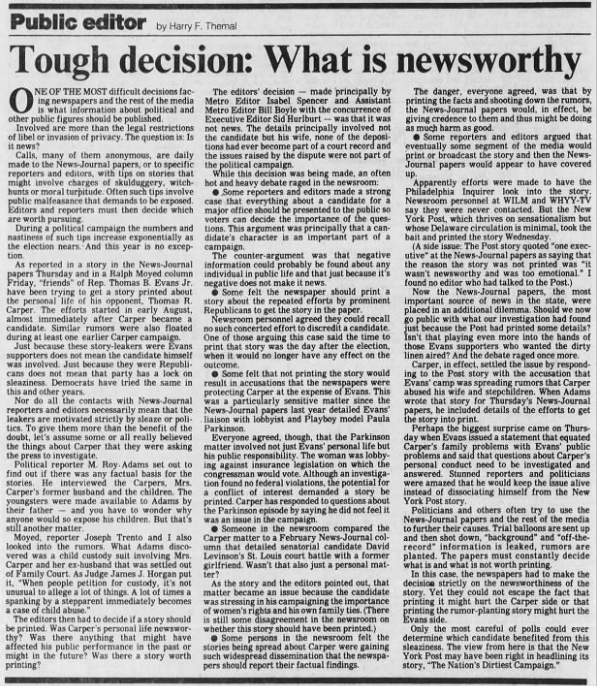 The News Journal‘s public editor then published a lengthy piece titled, "Tough Decision: What is newsworthy," explaining that the paper had been tipped off on the abuse allegations months earlier and conducted interviews with the Carpers, their children, and the ex-husband, but ultimately editors decided "it was not news." News Journal columnist Ralph Moyed used the story as an opportunity to attack Carper's Republican opponent Tom Evans, who was accused of placing them with the Post. Moyed belittled charges of "a father swatting his stepchildren and/or his wife" and called Republican efforts to spread the story a "low blow." He said the paper didn't report on it because "charges could not be substantiated." In the end, Carper won the election and the Post story was widely viewed as one of the main reasons. Voters in Delaware were turned off by mud-slinging and blamed the Republican incumbent. A few months later in 1983, his first year in office, Carper filed for divorce with Diane, citing "irreconcilable differences." Carper has managed to avoid answering questions on the abuse accusation for nearly his entire political career, even though they resurfaced in 1996 when he was running for a second term as governor, Cohen writes in her book. "Although public opinion [during the election] swayed Carper's way, the incident was perhaps the lowest in his public life," Cohen wrote in her book. "He would not speak of the allegations, even when they were repackaged and resurfaced 14 years later while he was running for a second term as governor. In an interview in 1998 for this writing, however, he dealt with them straightforwardly." Carper's decision to admit to the abuse accusations he previously denied is unclear. Cohen explains in her book, however, that Carper's 1996 Republican opponent Janet Rzewnicki had been circulating the deposition where Carper admits to hitting his wife. The News Journal again turned the story on Republicans with headlines such as "Rzewnicki dug for dirt on Carper." Carper never addressed the allegation and went on to win reelection handily. 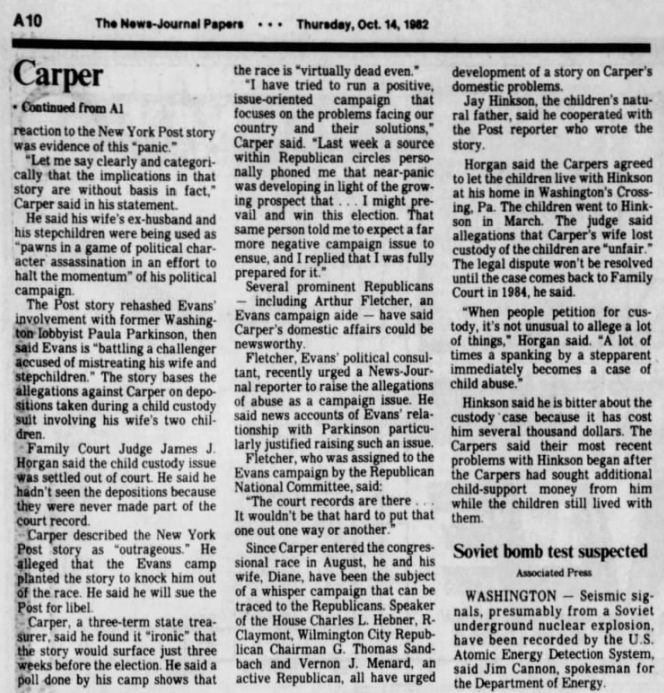 In a 2000 profile of Carper ahead of his first Senate run, however, the News Journal highlighted his ability to "steer around rocks of calamity" and published parts of the deposition that the 1982 Post story seems to be based on. "In the deposition, Carper told [the ex-husband's] lawyer that he and his wife argued frequently," the News Journal wrote. "Carper said Diane had thrown away his naval uniforms, and hit him during arguments, according to the deposition." 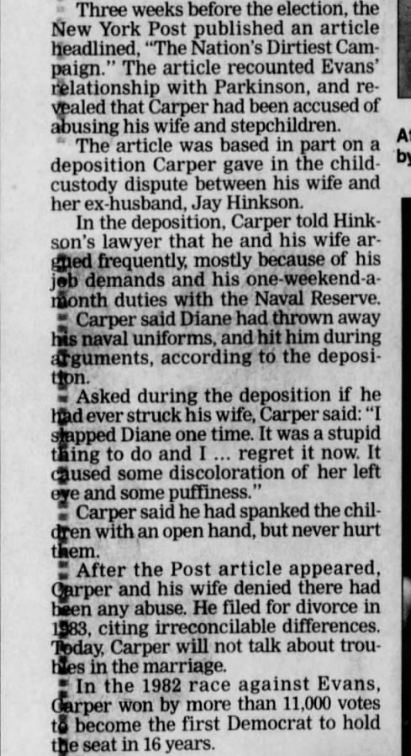 The deposition did in fact include an admission by Carper that he hit his wife and gave her a black eye. 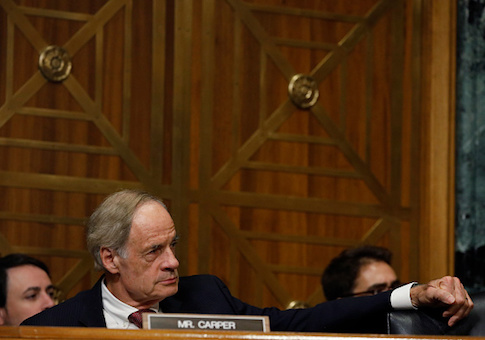 "I slapped Diane one time," Carper said in the deposition, according to the report. "It was a stupid thing to do and I … regret it now. It caused some discoloration of her left eye and some puffiness." Carper also admitted to spanking the children during the 1981 deposition, the report said. 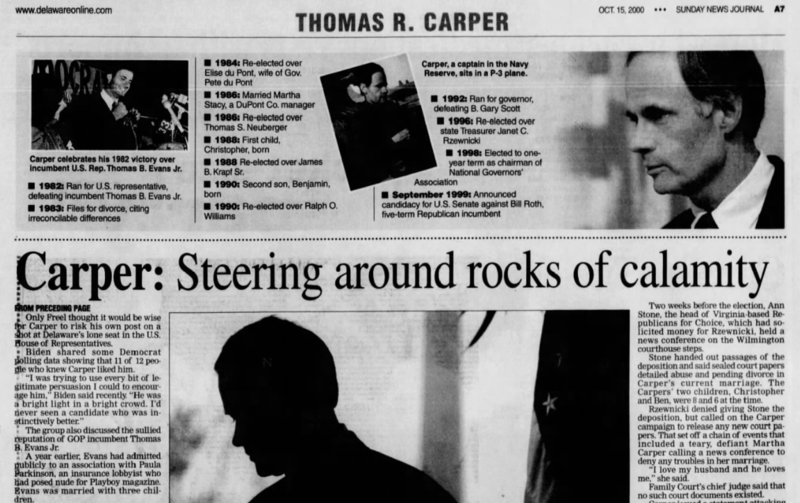 "Today, Carper will not talk about troubles in the marriage," the News Journal reported in 2000. Diane Carper died in 2013. In 1985 Carper married his current wife, Martha. They have two children. After reports of marital trouble in his second marriage, Martha put out a statement denying all of it and saying, "I love my husband and he loves me." Carper's Senate office did not respond to inquiries into why he denied accusations into treatment of his wife when he later admitted they were true. It remains unclear whether he ever filed a libel lawsuit against the Post. Hours after publication of this article, Carper provided the following statement to the New York Times. "In 1982, during my first campaign for Congress, I was falsely accused of beating my wife and physically abusing my stepchildren. I defended myself by telling the truth, and was joined in that defense not only by my former wife, Diane, but also by her children, Greg and Stephanie. I stand by what I said back in 1982, as does Greg, whom I raised for five years and consider my own. I believe that if Diane and Stephanie were still living, they would stand by me, too. "That said, I have made many mistakes in my life and have always been willing to admit them. One of those mistakes took place 37 years ago when I slapped my then-wife, Diane, during a heated argument. It was wrong. I regretted it then and I still do today. During a child custody battle between Diane and her former husband, I was truthful about this incident. I was truthful again when asked about it during a 1998 interview. "Any claim that I lied or attempted to hide my behavior is false. I am a man who has made his share of mistakes, but I am not and never have been one who abuses his wife and children. You don't have to take my word for it. My late first wife was very clear to our local paper back in 1982 – she never would have allowed her children or herself to be abused. Greg's words from the 1990s speak volumes about the kind of stepfather I was to his sister and him. "This is a difficult topic that dredges up feelings from many decades ago, but sunshine is the best disinfectant. I am grateful that my family has accepted the mistakes that I've made in the past and that they love me today. My stepson, Greg, and his family remain a special part of my life, as does his maternal grandmother, whom I still visit at her home in Sussex County Delaware, as recently as last month." UPDATE 8:20 p.m.: This story was updated to include Carper's statement to the New York Times.